This article discusses plot developments in games over the last 20 years, INCLUDING recent titles! A few weeks ago I was engaged in a discussion that I wanted to bring here. Emotional ties to characters, with particular regard to mortality, in video games. Full disclosure, I’m not much of an RPG player. Combining this with that, comparing the stats of the 200 items in my inventory and equipping the right armor for the boss I’m about to fight, keeping in mind that I’ll get a mana buff if I wear that gauntlet, but it will reduce my character’s charisma… I just don’t give a crap. I’m sorry. But what draws me to games like those in the Elder Scrolls or Ultima series, or even Final Fantasy, are the story lines. I absolutely love a story I can get lost in. Characters I can relate to or at least feel for are key. After playing through games like Crackdown, or even the B-game game MorphX I have no remorse for some characters, no matter where the story takes them. Enter Gears of War 3. While playing the latest chapter in the Gears of War saga, I met a moment that turned my discussion just a few weeks ago into something tangible for me that I haven’t experienced in over a decade. True emotional connection to a video game. We’ll get to that in a moment. I’m not kidding, we’re about to get spoiler-rific! My discussion a few weeks ago began with Wing Commander. The saga that defined the space opera, and not only affected the space-sim genre, but several Sci-Fi TV shows and movies. Wing Commander forced you to get to know the characters. You sat down and talked with them. You had a drink at the bar with them. You got to know their personalities, their flying styles. And, like almost no other game to date, you had to watch your wingmen die at an extraordinary rate. You speak at their funeral, you send them off in to space with a final salute. It is a sincere moment. It’s not just another man down or some kind of game over screen. It’s war. You have to carry on, but only after you pay proper tribute to your fallen comrade. Wing Commander may have impacted me for several reasons. I was young, I hadn’t yet experienced “death” the way I would later in life (a surreal few years in college had me attending annual funerals for friends, family, and acquaintences). In addition to my youth, I had time to grow and connect with these characters. Some may have died right away in Wing Commander, some in Wing Commander II. Entire carriers and transports are lost, filled with characters you know, love, or maybe just met (or in the case of some civilian transports, haven’t met). Although it can be vague, sometimes it’s someone you’ve flown with for a long time, perhaps for multiple games in the series. Then one day they don’t come back. Wing Commander even made this personal touch part of their introduction for Wing Commander II, stating in their promotional materials:For years, your lightning-quick reflexes and instinctive dogfighting tactics went to waste while the Kilrathi killed your closest friends on the front lines. Several “indie” games, like Limbo or or Braid try to tug at your heart strings. The end of Braid has that “ah-ha!” moment, where the developers pull a “got’cha!” and you realize you haven’t been the good guy all along. It twists you perception, it may even shock you from a story-telling perspective. But I didn’t really feel any different. The same goes for Bioshock and Bioshock 2 – take the first, for example. The “would you kindly” twist was unexpected. It was an explaination for why you followed a linear story line. It was unlike anything I had experienced before, mind blowing! But killing Andrew Ryan did not impact me in the least. I was never concerned when I found out that the princess was in another castle. I wasn’t moved at the end of Heavenly Sword when Kai set Nariko out to sea. In Red Dead Redemption your main character is killed off, leaving you to complete the game as your own son. In the Halo trilogy you’re forced to carry on while Cortana torments you from a distance. But I never care. I just trudge along, waiting for the story to resolve itself. Back to Gears of War 3. I was highly detached from the second game in the series. Kim and Carmine died in the first game. I barely knew any characters in the second (the entire game was built as fluff and filler and centered around it’s multi-player offerings, it did nothing for me and barely moved the story along apart from some predictable and cliche moments, in my opinion). But in Gears 3, which I haven’t even completely finished, my world was rocked. It was predictable, I agree. But it was executed with perfection and precision. 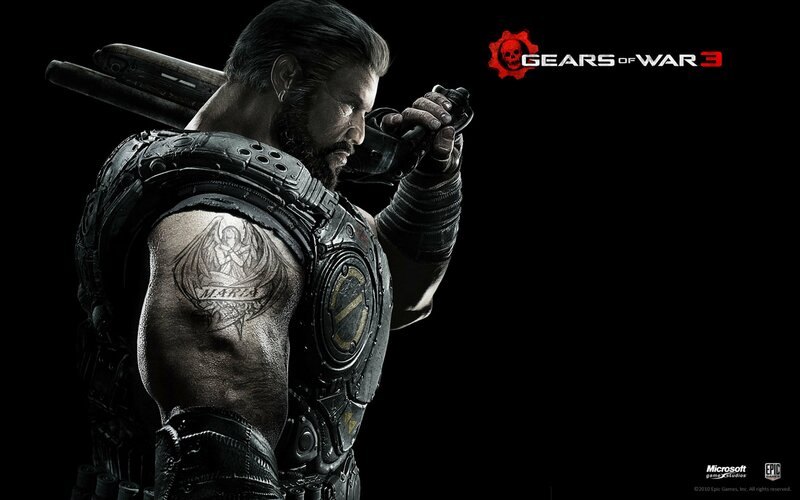 Harkening back to the commercials used for Gears of War 2, soft music plays as vibrant imagery fulfills what Cliff Bleszinski has called “destroyed beauty” from the very beginnings of Gears of War. I could actually feel something. To save his team, Dominic Santiago will scuttle a truck into a tanker of fuel. As soon as everything started building up to this, I could feel myself beginning the five stages of grief. Denial. Then anger. Then bargaining, with myself – mostly, because the cutscene had already begun – but wishing Dom could hear me. Then depression hit me like a rock. I’m waiting for the acceptance part. I’ve stopped playing the game for a few days to really soak in what has happened. Marcus doesn’t get to, in the game. But I do. During my hiatus, I’ve had time to think. Why does this affect me so much? And I’ve realized a few things. The first is what I call “emotional momentum.” To see if this was a real thing, I searched the term online quickly and came up with tips for texting your way into some hot and heavy conversation, so I highly doubt that it is. Perhaps I’m coining the term, at least in this context. Regardless, emotional momentum is the pace and substantiality on which a relationship is formed. With most video games, you are supposed to bond with and care for characters you are just meeting. Then, somewhere in your six hour adventure, they are taken away and it supposed to shatter you, emotionally. I haven’t played Heavy Rain, but I heard more people cheered when an annoying child was mowed down by traffic, than people who genuinely fealt remorse. There wasn’t a real relationship built, and that which was there was thrown at you with the sole function at trying to make you teary-eyed later. You saw it coming. You haven’t had time to build a relationship, or situations which allowed you to get to know the characters. At least one or the other, if not both, is required – chatter during battle, or a cutscene where you learn your partner’s wife’s name? That’s just not enough. Wing Commander was different because I had sat down and had drinks with the characters, had conversations with them. Then I looked at that chair they had always sat in, and they weren’t there anymore. Gears of War 3 has made me take pause becase I know Dom. I’ve been with him through his struggles, but we’ve come out stronger after each and every mission. Sure, I mocked him in Gears 2 – I even expected him to die in combat if he couldn’t get his act together. But he always came through for me. We’ve literally defeated hoards of Locust enemies together. I’ve known Dom for the last five years of my life. Yet there he was, one last time, selflessly making sure his squad mates were going to get out of the city of Mercy and carry on toward Azura. He will be sorely missed. I’m very interested in this topic and may research it further. I would be interested in fleshing this idea out, and perhaps creating a panel to discuss similar events in gaming. What memories do you have? Was there a moment in another game that actually gave you enough time to develop a relationship with a character, only to have it taken away? Final Fantasy VII, I’ve heard, may have had a moment that hit some players. What about you? Please discuss. And if you’ve actually read this far, thank you, genuinely.